Frantic rescue efforts are underway to free people trapped in the rubble after a massive 7.0 magnitude earthquake hit the Caribbean nation of Haiti. The tremor sparked widespread panic as it brought down buildings including the presidential palace, hotels, a hospital and the UN headquarters in the capital of Haiti, Port-au-Prince (affected landmarks on Google maps). Large numbers of UN staff were reported to be missing, as well as two American and two Australian citizens. 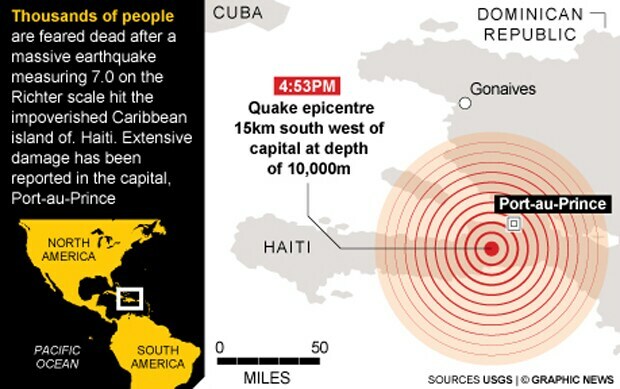 The quake was the strongest to hit the country in 200 years and was felt as far away as Cuba.